At ThinkFun, we’re passionate about our effort to make learning fun. It drives everything we do – and every game, brainteaser and puzzle we create. We love being the spark that ignites young minds and gives children an early learning advantage. In 1985, ThinkFun was founded with a dream. Husband and wife team Bill Ritchie and Andrea Barthello wanted to change the world through play and make learning fun. Bill was a born puzzler. Andrea was no stranger to a challenge. However, the 80’s were a tough time for toy companies. Retailers were moving away from games and the Rubik’s Cube, which had been a huge fad, had just crashed hard, and toy store owners were sick of brainteasers. In the early years, Bill and Andrea’s basement served as an assembly line, home office and distribution center. Right out of their basement the first product, the Hexadecimal Puzzle, was born! 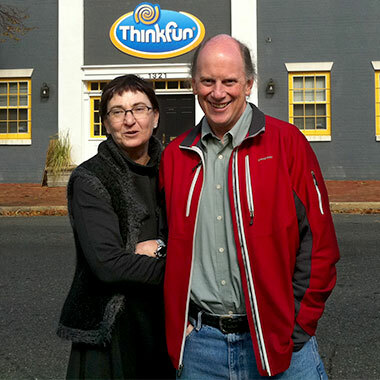 Despite humble beginnings, Bill and Andrea founded ThinkFun, originally called Binary Arts, with a noble mission, “to translate the brilliant ideas of the craziest mathematicians, engineers and inventors into simple toys that can be appreciated by boys and girls around the world.” We still believe in this mission today. Over the years we have strengthened our commitment to creating products that naturally inspire learning, spark creativity and build 21st century thinking skills through play. ThinkFun is a respected and award-winning global company with its products represented in over 60 countries and translated into over 20 languages. We continue to push into new frontiers with mobile apps, fun online games, global education programs, STEM development games and other fun games that teach 21st century thinking skills. And as always, we’re making learning fun – at any age. Click here to see our educational fun games.